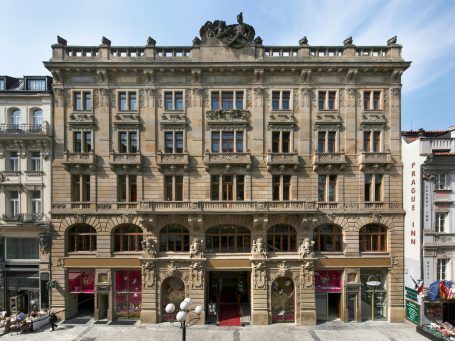 Leading Czech real estate company MAX Immo has announced it has been appointed as an exclusive partner for the leasing of City Palais building situated in the attractive location of Prague’s “Golden Cross”. The owner of City Palais – Redevco – commissioned MAX Immo to secure the leasing. The building provides office, retail and residential space on an area of 7,500 square metres. MAX Immo has already succeeded to mediate a short-term tenant for the retail premises – Gallery of Steel Figures, an internationally successful exhibition of hand-crafted metal sculptures. “During the next months, we will concentrate on securing long-term or permanent tenants for the building,” said Martin Indra, Retail Specialist at MAX Immo. MAX Immo specializes in prime properties in premium locations and in this case will exclusively secure the leasing of all six above-ground and two underground floors of City Palais. The building is situated on a busy intersection of two of the most important shopping streets in Prague: Na Příkopě Street and Wenceslas Square, providing 3,500 square metres of retail space and 2,250 metres of office space. It also features two luxurious apartment units. “I am delighted that Redevco, the owner of City Palais, had decided to grant such an exclusive deal to us. This gives us an opportunity to follow up on the successful cooperation from last year´s when we advised Redevco in the closing of the deal on the purchase of this building,“ said Carlo Gradl, Managing Director of MAX Immo. 40 million euros, was their first investment in Prague and became one of the most significant transactions on the domestic market of commercial real estate last year. MAX Immo aims at bringing new and interesting concepts to City Palais that will add value to Prague’s retail landscape. The history of City Palais goes back to the early 20th century. It was designed by renowned Czech architect Matěj Blecha and it is decorated with works by the sculptor Celda Klouček.